Chocolate and oats are two of my favourite things and together they work a treat. My chocolate coconut flapjacks are an all round winner and my recipe is now regularly used by friends. This month’s We Should Cocoa was to create something that contained both chocolate and oats. Read on to find eight fabulous recipes using these two ingredients. Look out for next month’s ingredient over at Green Gourmet Giraffe tomorrow. Johanna is hosting We Should Cocoa in June and I’m looking forward to the theme. Now let’s get on with what you’ve all been waiting for. Kicking things off in fine style Lucy from Baking Queen 74, also known as the Slow Cooker Queen, gives us this cacao oat slice with date caramel. Baked in her slow cooker, it’s dairy free and includes cacao nibs. It also has a luscious layer of caramel on top, made with dates not sugar. Healthy bakes seem to be the order of the day as Janice from Farmergirl Kitchen has made chocolate, oat an banana nut muffins with coconut oil and yoghurt. Stuffed with all sorts of good things, including dark chocolate, they are surprisingly simple to make. I’m rather relieved to see that the health trend has not affected all of this month’s We Should Cocoa entries. Chocolate and oats have formed a thoroughly decadent bake in these Chocolate Toffee Oaty Squares from Suelle at Mainly Baking. Mars Bars, cream, butter, sugar and more chocolate, how can we resist? It’s back to the healthy recipes again with this no dairy chocolate smoothie with pumpkin seed butter – and oats of course. Sarah from Maison Cupcake has piled all sorts of good things into this smoothie including coconut milk, cocoa powder and oats. It must be a sign of the times. I to went for a healthy recipe. Healthy it maybe, but these chilli chocolate chip cookie dough energy balls taste sublime and feel like a decadent treat. Overnight chocolate oats from Rebecca at BakeNQuilt is made, not as you’d expect, with rolled oats, but with steel cut oats. You’ll need to visit her post to find out what they are. For a special treat, she tops of her chocolate oats with raspberries, yoghurt and chocolate chips. No bake peppermint pattie slice might sound like a rather strange form of peppermint cream, but I can assure you it’s not. It’s a fabulous Australian slice from Johanna at Green Gourmet Giraffe, made with chocolate and oats of course, that was so good, she made it three times in two weeks. As you can see from the picture, coconut features too. This chocolate cherry flapjack is one of a batch that Chris from Thinly Spread made to cheer up her daughter, who is in the midst of horrid exams. I think these would cheer up just about anybody, especially with those lush chocolate dipped cherries on top. What a fabulous round up. Chocolate and oats are just made for each other and provide a great balance of nutritious food and tasty treat. Thanks for keeping this great challenge going and inspiring so many fabulous recipes. Thanks Janice. It’s been touch and go, but I always look forward to seeing what people come up with – several books worth over the years. These certainly are fabulous recipes. I love all of them! Me too Catherine. Every time I do a We Should Cocoa round-up, I want to dash down to the kitchen and try out all the recipes. Thanks Johanna. I do love chocolate and oats, so I really think I might be trying all of these out at some point. Well I love chocolate and I love oats so these all sound amazing to me! 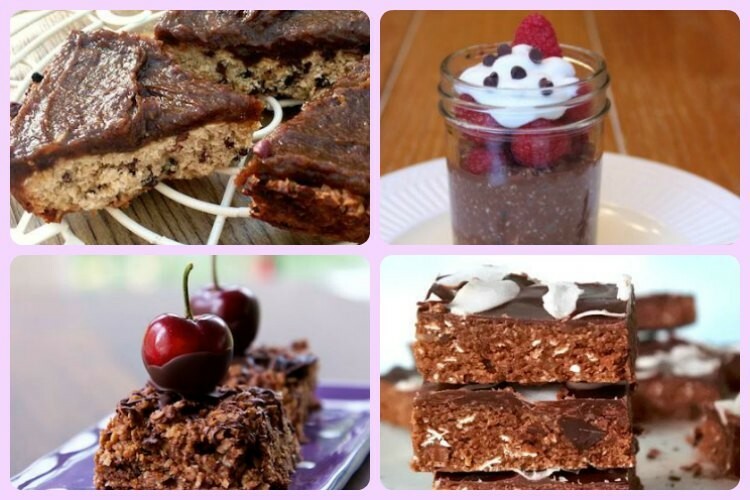 Chocolate and oats is a wonderful combination, loads of great ideas here!! You can’t go wrong with chocolate and oats, it’s a great combination. Lots of inspiration here, thanks! This looks like a great round up of some fab recipes. Thanks Nayna. I always look forward to the #WeShouldCocoa round-ups. Mine too CC, luv em prepared pretty much anyhow. Yay for chocolate and oats, they are a good combination Sarah. Shame we missed your chocolate flapjacks. I’m heading over now to have a look.